For anyone who has spent a good third of a Transformers: Dark Of The Moon screening trying to dislodge an errant popcorn hull from between their teeth and wondering how popcorn-eating ever became a cinematic ritual in the first place, Mental Floss has the answer. It was hot, buttery, salty economic convenience, baby. Jumbo sized and served by the tub. 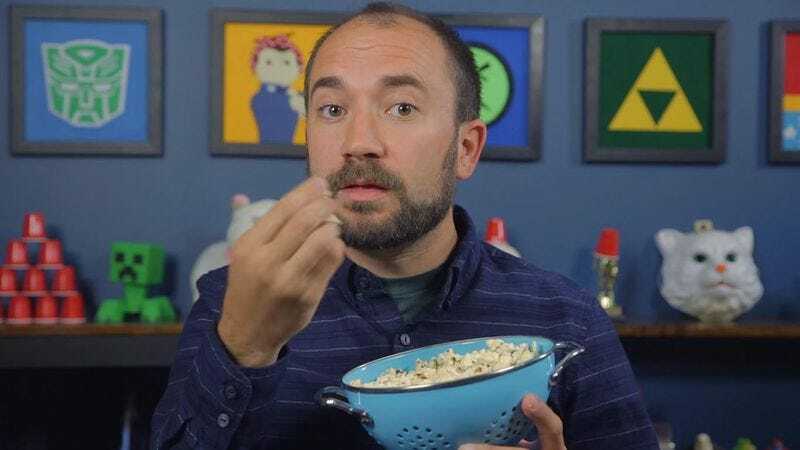 In the latest episode of the long-running Big Questions series, bearded host Craig Benzine delves into the artery-clogging history of popcorn consumption in movie theaters, prompted by a question from viewer Bradley Stein. Back in the 19th century, there were no movie theaters, so popcorn was mostly still a circus food. By the time movie theaters started popping up in the 1900s, they were too small to even accommodate a concession stand, so vendors sold their so-called popped corn on the sidewalk outside. The fancy-schmancy movie palaces of the 1920s were considerably roomier than their predecessors, but they were not hospitable to potentially messy snacks like popcorn. “Popcorn and expensive carpet,” Benzine explains, “are not friends.” It took the miracle of the Great Depression to integrate the buying, selling, and eating of popcorn fully into the movie-going ritual. People back then needed something cheap to gnaw on while they tried to forget their problems for a few hours. In fact, Benzine says, it was popcorn sales that allowed many movie theaters to stay open during those economically blighted times. Today, according to the video, movie theaters earn “about 85 percent of their profits” from concessions. So really, movies have attached themselves to big popcorn and not the other way around.